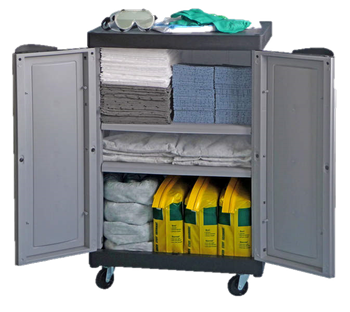 ​​​​​​The wheeled Mobile Station (Spill Kit) with personal protective equipment is practical and clearly arranged. The product needed is easily and quickly accessible. Depending on the Spill Kit type, Chemical and Oil Absorbents for the widest variety of applications are contained. Unique with Green Stuff Universal Absorbent Concentrate, the super binder suitable for almost all liquids, in 10 litre reclosable bag to spread onto the surface, in absorbent dikes to contain spillages and in pillows to find a solution in case of dripping parts or other leaks. Grey RAW EcoLine Universal Sorbent for absorbing almost all common oils, coolants, lubricants, solvents and water-based liquids, such as acids and bases. White RAW EcoLine Oil Sorbent for only absorbing hydrocarbon-based liquids, such as oils, gasoline, etc. Able to float and very well suited for separating oil from water indoors and outodoors. For daily needs, ​STAR Cleaning Wipes, solvent resistant, reusable more times and made of 100% polypropylene, are available.